Home » Online Exhibits » Penn People » Penn People A-Z » Morris Hacker, Jr.
Morris Hacker, Jr., was born on October 29, 1886, the son of Morris Hacker and Isabel Wetherill. 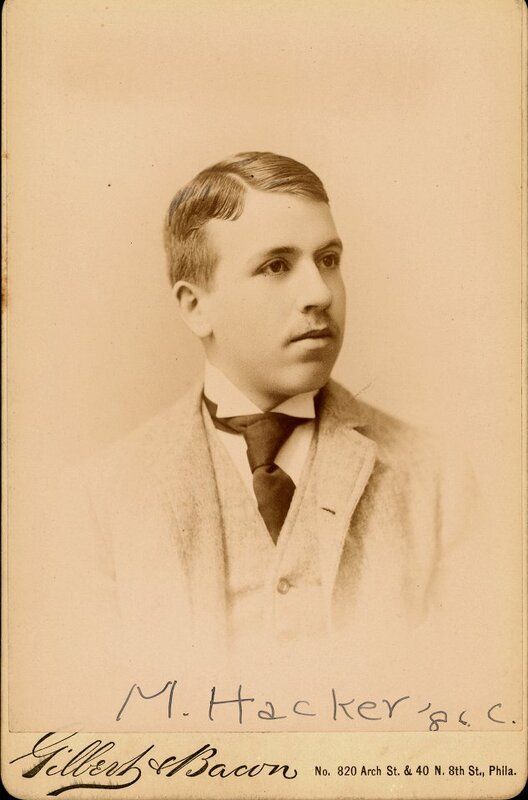 He entered the University of Pennsylvania in 1882. Not much is recorded about Hacker’s athletic pursuits at the University of Pennsylvania as a freshman. During his sophomore year, however, he is known to have been very active in athletics, serving on the class teams for football, baseball, tennis, and lacrosse and as a member of the Class of 1886 Lacrosse Club. He also joined the Zeta Psi fraternity during his sophomore year. During his junior year, Hacker was a substitute on the University baseball team and a member of the class teams for football, baseball, cricket, and lacrosse. He also joined the Class of 1886 Tennis Club. In his senior year he was the member of the Class of 1886 Racket Club as well as of his class football team. As an undergraduate, Hacker served as one of the models for Eadweard Muybridge’s landmark study, Animal Locomotion. Matriculating in the Towne School of Sciences but leaving the college before the end of his senior year, he became a civil engineer. His professional life included the positions of chief engineer of the Ohio Railway and Electric Company, and superintendent of county roads as well as building inspector in Washington, D.C. An Orthodox Quaker, he served as a member of the Appeal Division of the Registration Board, Washington, D.C., during World War I.
Hacker died on March 3, 1947.